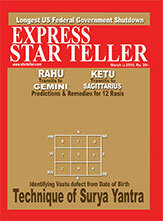 Express Starteller is one of the most popular and highly circulated, premier English language Astrological monthly. We have been able to craft a unique position for our magazine in the life of our readers with crisp and lucid articles, entertaining anecdotes, striking visuals etc. 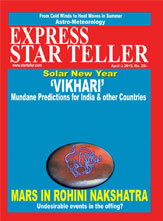 Express Starteller is the choice of a wide cross-section of people - from housewives to industry leaders to scientists. This offers a big opportunity to the International community of Astrologers to reach out to their target audience with minimal efforts. Our 'Classified Ads for International Astrologers' allows you to reach out to your customers at extremely nominal advertising rates of US$ 2.00 per word (minimum 20 words). Click here to view a sample classified ad. Simply fill in the details below, pay online using our secure payment gateway and get ready for orders from your propspects. Click here for more advertising options. * Please ensure that you fill the correct figure here as we cannot post an ad with higher number of words than what you fill. Click here for more advertising options.